Starting this week, KFC will be serving up new Chicken and Waffles for a limited time through the end of the year at participating locations. The new menu item pairs KFC's fried chicken or fried chicken tenders with Belgian liege waffles, a type of waffle that is a little denser and chewier than what we generally think of as Belgian waffles. They're also sweet with a bit of caramel flavor and crispiness from pearl sugar that's mixed into the dough/batter. According to the NRN, KFC the new waffles are thawed and then fried to order. You can get one waffle, a small cup of Mrs. Buttersworth's syrup, and either a filet, thigh and drumstick, or three-piece Extra Crispy tenders for $5.49. If you want more of a sandwich, the Chicken and Waffle Sandwich features two waffles and a Extra Crispy filet drizzled with Hot Honey sauce for $5.99 (prices may vary). 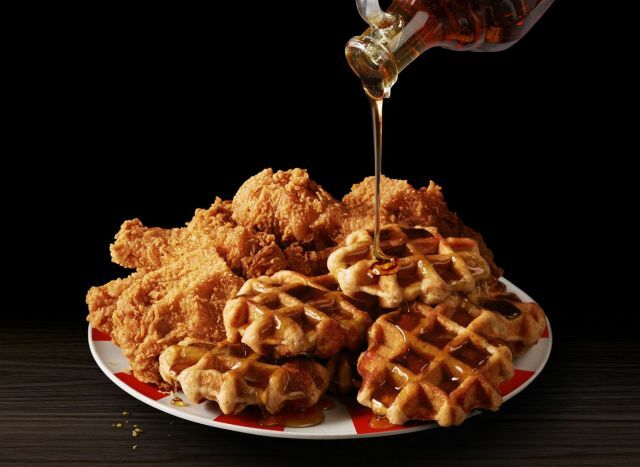 If you want something heartier or are looking to share, the Big Basket meal starts at $7.99 and includes two waffles, two cups of syrup, and a choice of two pieces of white meat fried chicken, three pieces of dark meat fried chicken, or four tenders. Chicken and Waffles was previously tested by the fried chicken chain in North Carolina earlier this summer.